This article is about the diacritic used to modify other characters. For use as an independent, spacing character, see Caret. The circumflex is a diacritic in the Latin, Greek and Cyrillic scripts that is used in the written forms of many languages and in various romanization and transcription schemes. It received its English name from Latin circumflexus "bent around" – a translation of the Greek περισπωμένη (perispōménē). The circumflex in the Latin script is chevron-shaped ( ˆ ), while the Greek circumflex may be displayed either like a tilde ( ˜ ) or like an inverted breve ( ̑ ). In English the circumflex, like other diacritics, is sometimes retained on loanwords that used it in the original language (for example, rôle). The diacritic is also used in mathematics, where it is typically called a hat or roof or house. The shape of the circumflex was originally a combination of the acute and grave accents (^), as it marked a syllable contracted from two vowels: an acute-accented vowel and a non-accented vowel (all non-accented syllables in Ancient Greek were once marked with a grave accent). Later a variant similar to the tilde (~) was also used. The term "circumflex" is also used to describe similar tonal accents that result from combining two vowels in related languages such as Sanskrit and Latin. Since Modern Greek has a stress accent instead of a pitch accent, the circumflex has been replaced with an acute accent in the modern monotonic orthography. The circumflex accent marks a long vowel in the orthography or transliteration of several languages. Akkadian. In the transliteration of this language, the circumflex indicates a long vowel resulting from an aleph contraction. French. In some varieties, such as in Belgian French, Swiss French and Acadian French, vowels with a circumflex are long: fête [fɛːt] (party) is longer than faite [fɛt]. This length compensates for a deleted consonant, usually s.
Japanese. In the Kunrei-shiki and Nihon-shiki systems of romanization, and sometimes the Hepburn system, the circumflex is used as a replacement for the macron. In Serbo-Croatian the circumflex can be used to distinguish homographs, and it is called the "genitive sign" or "length sign". Examples include sam "am" versus sâm "alone". For example, the phrase "I am alone" may be written Ja sam sâm to improve clarity. Another example: da "yes", dâ "gives". Turkish. According to Turkish Language Association orthography, düzeltme işareti "correction mark" over a, i and u marks a long vowel to disambiguate similar words. For example, compare ama "but" and âmâ "blind", şura 'that place, there' and şûra "council". In general, circumflexes occur only in Arabic and Persian loanwords as vowel length in early Turkish was not phonemic. However, this standard was never applied entirely consistently and by the early 21st century many publications had stopped using circumflexes almost entirely. Welsh. The circumflex is known as hirnod "long sign" or acen grom "crooked accent", but more usually and colloquially as to bach "little roof". It lengthens a stressed vowel (a, e, i, o, u, w, y), and is used particularly to differentiate between homographs; e.g. tan and tân, ffon and ffôn, gem and gêm, cyn and cŷn, or gwn and gŵn. In Adûnaic, the Black Speech, and Khuzdul, constructed languages of J. R. R. Tolkien, all long vowels are transcribed with the circumflex. In Sindarin long vowels in monosyllabic words take the circumflex and long vowels in longer words take the acute. 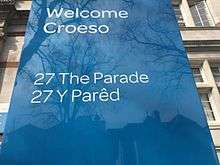 Bilingual sign showing the use of the circumflex in Welsh as an indicator of length and stress: parêd [paˈreːd] "parade", as opposed to pared [ˈparɛd] "partition wall". Portuguese â, ê, and ô are stressed “closed” vowels, opposed to their open counterparts á, é, and ó (see below). Welsh: the circumflex, due to its function as a disambiguating lengthening sign (see above), is used in polysyllabic words with word-final long vowels. The circumflex thus indicates the stressed syllable (which would normally be on the penultimate syllable), since in Welsh, non-stressed vowels may not normally be long. This happens notably where the singular ends in an a, to, e.g. singular camera, drama, opera, sinema → plural camerâu, dramâu, operâu, sinemâu; however, it also occurs in singular nominal forms, e.g. arwyddocâd; in verbal forms, e.g. deffrônt, cryffânt; etc. In Afrikaans, circumflex simply marks a vowel with an irregular pronunciation that is typically stressed. Examples of circumflex use in Afrikaans are sê 'to say', wêreld "world", môre "tomorrow", and brûe "bridges". In Bamanankan, it marks a falling tone, as opposed to a háček which signifies that on this syllable, the tone is rising. In Breton, it is used on an e to show that the letter is pronounced open instead of closed. In Bulgarian, the sound represented in Bulgarian by the Cyrillic letter ъ (er goljam) is usually transliterated as â in systems used prior to 1989. Although called a schwa (misleadingly suggesting an unstressed lax sound), it is more accurately described as a mid back unrounded vowel /ɤ/. Unlike English or French, but similar to Romanian and Afrikaans, it can be stressed. In Pinyin romanized Mandarin Chinese, ê is used to represent the sound /ɛ/ in isolation, which occurs sometimes as an exclamation. in French, the letter ê is normally pronounced open, like è. In the usual pronunciations of central and northern France, ô is pronounced close, like eau; in Southern France, no distinction is made between close and open o.
Portuguese â /ɐ/, ê /e/, and ô /o/ are stressed high vowels, in opposition to á /a/, é /ɛ/, and ó /ɔ/, which are stressed low vowels. In Slovak, the circumflex (vokáň) turns the letter o into a diphthong: ô /uo/. In Swedish dialect and folklore literature the circumflex is used to indicate the phonemes /a(ː)/ or /æ(ː)/ (â), /ɶ(ː)/ or /ɞ(ː)/ (ô) and /ɵ(ː)/ (û) in dialects and regional accents where these are distinct from /ɑ(ː)/ (a), /ø(ː)/ (ö) or /o(ː)/ (o or å) and /ʉ(ː)/ (u) respectively, unlike Standard Swedish where [a] and [ɑː], [ɵ] and [ʉː] are short and long allophones of the phonemes /a/ and /ʉ/ respectively, and where Old Swedish short /o/ (ŏ) has merged with /o(ː)/ from Old Swedish /ɑː/ (ā, Modern Swedish å) instead of centralizing to [ɞ] or fronting to [ɶ] and remaining a distinct phoneme (ô) as in the dialects in question. Vietnamese â /ə/, ê /e/, and ô /o/ are higher vowels than a /ɑ/, e /ɛ/, and o /ɔ/. The circumflex can appear together with a tone mark on the same vowel, as in the word Việt. Vowels with circumflex are considered separate letters from the base vowels. In Emilian, ê ô [eː, oː] denote both length and height. In Romagnol, they are used to represent the diphthongs /eə, oə/, whose specific articulation varies between dialects, e.g. sêl [seəl~seɛl~sæɛl~sɛɘl] "salt". In Chichewa, ŵ (present for example in the name of the country Malaŵi) used to denote the voiced bilabial fricative /β/; nowadays, however, most Chichewa-speakers pronounce it as a regular [w]. In Pinyin, the romanized writing of Mandarin Chinese, ẑ, ĉ, and ŝ are, albeit rarely, used to represent zh [tʂ], ch [tʂʰ], and sh [ʂ], respectively. In Nsenga, ŵ denotes the labiodental approximant /ʋ/. In Philippine languages, the circumflex (pakupyâ) is used to represent the simultaneous occurrence of a stress and a glottal stop in the last vowel of the word. In Old Tupi, the circumflex changed a vowel into a semivowel: î [j], û [w], and ŷ [ɰ]. In Turkish, the circumflex over a and u is sometimes used in words of Arabic or Persian derivation to indicate when a preceding consonant (k, g, l) is to be pronounced as a palatal plosive; [c], [ɟ] (kâğıt, gâvur, mahkûm, Gülgûn). The circumflex over i is used to indicate a nisba suffix (millî, dinî). In the African language Venda, a circumflex below d, l, n, and t is used to represent dental consonants: ḓ, ḽ, ṋ, ṱ. In the 18th century, the Real Academia Española introduced the circumflex accent in Spanish to mark that a ch or x were pronounced [k] and [ks] respectively (instead of [tʃ] and [x], which were the default values): châracteres, exâcto (spelled today caracteres, exacto). This usage was quickly abandoned during the same century, once the RAE decided to use ch and x with one assigned pronunciation only: [tʃ] and [ks] respectively. In 18th century British English, before the cheap Penny Post and while paper was taxed, the combination ough was occasionally shortened to ô when the gh was not pronounced, to save space: thô for though, thorô for thorough, and brôt for brought. Note that in current French, the English spellings, at least in terms of the syllable with the circumflex, could be pronounced the same as the French spellings, owing to the transformative effect of s on the preceding vowel – for example forêt [fɔʁɛ] "forest", as per est [ɛ] "is" (third person singular of être). Conversely, in the homograph est [ɛst] "east", the [s] sound is pronounced. In handwritten French, for example in taking notes, an m with a circumflex (m̂) is an informal abbreviation for même "same". In February 2016, the Académie française decided to remove the circumflex from about 2000 words, a plan that had been outlined since 1990. However, usage of the circumflex would not be considered incorrect. In Italian, î is occasionally used in the plural of nouns and adjectives ending with -io [jo] as a crasis mark. Other possible spellings are -ii and obsolete -j or -ij. For example, the plural of vario [ˈvaːrjo] "various" can be spelt vari, varî, varii; the pronunciation will usually stay [ˈvaːri] with only one [i]. The plural forms of principe [ˈprintʃipe] "prince" and of principio [prinˈtʃipjo] "principle, beginning" can be confusing. In pronunciation, they are distinguished by whether the stress is on the first or on the second syllable, but principi would be a correct spelling of both. When necessary to avoid ambiguity, it is advised to write the plural of principio as principî or as principii. In Norwegian, the circumflex differentiates fôr "lining, fodder" from the preposition for. From a historical point of view, the circumflex also indicates that the word used to be spelled with the letter ð in Old Norse – for example, fôr is derived from fóðr, lêr 'leather' from leðr, and vêr "weather, ram" from veðr (both lêr and vêr only occur in the Nynorsk spelling; in Bokmål these words are spelled lær and vær). Before the ð disappeared, it was replaced by an ordinary d (fodr, vedr). In mathematics, the circumflex is used to modify variable names; it is usually read "hat", e.g., î is "i hat". The Fourier transform of a function ƒ is often denoted by . In the notation of sets, a hat above an element signifies that the element was removed from the set, such as in , the set containing all elements except . In vector notation, a hat above a letter indicates a unit vector (a dimensionless vector with a magnitude of 1). For instance, , , or stands for a unit vector in the direction of the x-axis of a Cartesian coordinate system. In statistics, the hat is used to denote an estimator or an estimated value, as opposed to its theoretical counterpart. For example, in errors and residuals, the hat in indicates an observable estimate (the residual) of an unobservable quantity called (the statistical error). It is read x-hat or x-roof, where x represents the character under the hat. In music theory and musicology, a circumflex above a numeral is used to make reference to a particular scale degree. In music notation, a chevron-shaped symbol placed above a note indicates marcato, a special form of emphasis or accent. In music for string instruments, a narrow inverted chevron indicates that a note should be performed up-bow. The precomposed characters Â/â, Ê/ê, Î/î, Ô/ô, and Û/û (which incorporate the circumflex) are included in the ISO-8859-1 character set, and dozens more are available in Unicode. In addition, Unicode has U+0302 ◌̂ COMBINING CIRCUMFLEX ACCENT and U+032D ◌̭ COMBINING CIRCUMFLEX ACCENT BELOW which in principle allow adding the diacritic to any base letter. For historical reasons, there is a similar but larger character, U+005E ^ CIRCUMFLEX ACCENT, which is also included in ASCII but often referred to as caret instead. It is, however, unsuitable for use as a diacritic on modern computer systems, as it is a spacing character. Another spacing circumflex character in Unicode is the smaller U+02C6 ˆ MODIFIER LETTER CIRCUMFLEX, mainly used in phonetic notations – or as a sample of the diacritic in isolation. ↑ Weisstein, Eric W. "Hat". Mathworld. Wolfram. Retrieved 29 November 2016. ↑ Thackston, Wheeler M. (2006). "Kurmanji Kurdish: A Reference Grammar with Selected Readings" (PDF). Iranian Studies at Harvard University. Harvard University. p. 11. Retrieved November 26, 2016. ↑ "Genitivni znak". Pravopis Srpskog Jezika (in Serbian). ↑ Lewis, Geoffrey (1999). The Turkish Language Reform: A Catastrophic Success. ↑ Kornfilt, Jaklin (2013). Turkish. ↑ "Malawi: Maláui, Malaui, Malauí, Malavi ou Malávi?". DicionarioeGramatica.com.br. Retrieved 2015-10-25. ↑ Paul Morrow (March 16, 2011). "The basics of Filipino pronunciation: Part 2 of 3 • accent marks". Pilipino Express. Retrieved July 18, 2012. ↑ Ricardo M.D. Nolasco. Grammar notes on the national language (PDF). ↑ Joan Schoellner & Beverly D. Heinle, ed. (2007). Tagalog Reading Booklet (PDF). Simon & Schister's Pimsleur. p. 5–6. ↑ "End of the circumflex? Changes in French spelling cause uproar". BBC. 5 February 2016. Diacritics Project – "All you need to design a font with correct accents"